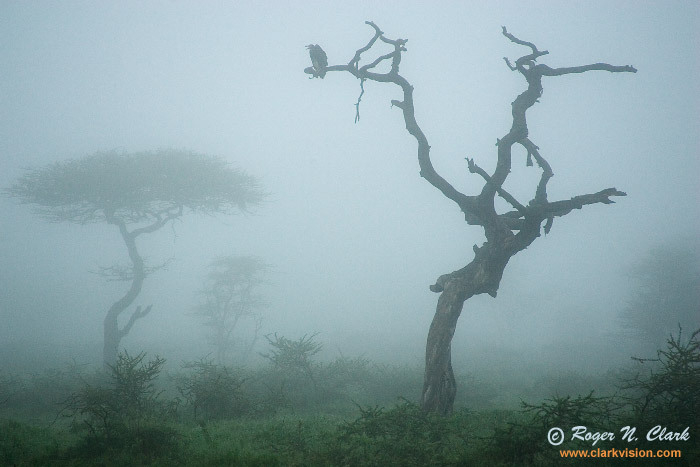 A Lappet-Faced Vulture sits in a tree in dense morning fog before sunrise. Ngorongoro Conservation Area (NCA), Tanzania, Africa. Technical: Canon 1D Mark II 8-megapixel camera, Canon 28-135 mm IS lens at 135mm, f/5.6. Exposure: 1/50 second at ISO 200. Full image, no crop.